If you wander down any high street in the UK, more than 75% of the coffee you will find will be Arabica. This species of ‘coffea’ is the most sought-after type, due to its sweetness and wide variety of flavours. With the industry ever changing, new hybrid varieties are being created by combining desirable traits from certain sub species, thus The Pacamara. This bean is a ‘Pacas’ and ‘Maragogype’ hybrid, offering rich indulgent flavours, with the familiar large beans aspect usually associated with Maragogype coffees. Adams + Russell roast the beans to a medium level, allowing the subtle flavours to come through. They are available in beans or ground and always delivered fresh! This hybrid was first bred in 1958 in El Salvador and was developed to create a variety of Typica with larger beans. Sarchimor – Resistant to leaf rust and has very large leaves. Bourbon – Has a large fruit and more balanced characteristics. Catimor – Also resistant to leaf rust and has an excellent body. Pacas – Large leaves and favourable characteristics. Pacamara – Large fruit and exceptional flavour. Espresso Guide tells us that El Salvador coffees tend to be softer and present less acidity than most Central American coffees. This paired with a honeyed sweetness makes a pleasant and easy to drink beverage, perfect for first thing in the morning. The flavour characteristics of El Salvador coffee varies from region to region. 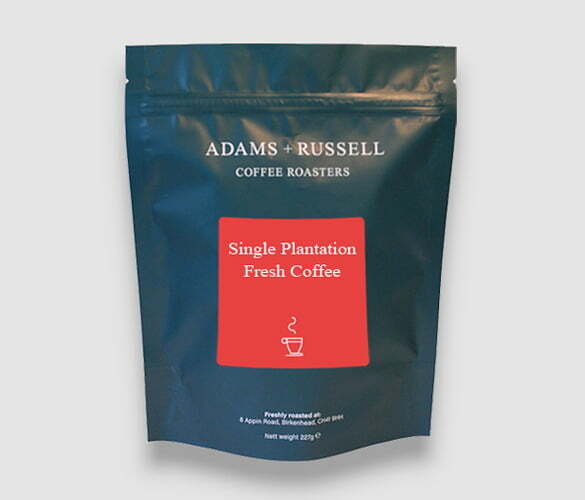 The Adams and Russell El Salvador beans have notes of chocolate, honey and berries. A medium roast and medium acidity provide a rich, smooth drink. El Salvador may be the smallest of the Central American nations, but that certainly doesn’t affect their coffee production. With average harvesting time being between October and March and elevations of up to 1,500m above sea level, the country has plenty of options for growing. These beans have been hand roasted by Adams and Russell’s at temperatures over 200°C. If you want to know exactly how we do it, you can read our blog post on the 7 magical steps to roasting. If you are buying beans, you will need a grinder before you can brew it. Aeropress – fresh coffee on the go in 11 seconds. Cafetiere – also great for fresh coffee on the go. Stove Top Espresso Maker – luxury brewing in the comfort of your own home. V60 Coffee Dripper – A long spouted pour over kettle to make excellent coffee at home.